From working on a AAA title at TaleWorlds Entertainment to working on applied games at GainPlay Studio, I've done a wide range of projects already. I'm a Grafisch Lyceum Utrecht Alumni, currently studying International Game Architecture and Design at Breda University. Experience in programming in different languages (such as C++, C# and Java), multiple engines, and even writing engines myself, for small uni projects, or for the Mount & Blade II Bannerlord project. View my skills and projects below to learn more about me. Current average grade is a 9, grading system. Graduated with an average grade of 8, grading system. Erasmus+ CEFR English test score C1: Effective operational proficiency or advanced. · Customer & corporate sales. · Hardware and software repairs. · Retours, orders and everything else needed to run the store. Unity3D | Unreal Engine | Android Studio. Adobe Photoshop, Illustrator and Dreamweaver | Maya, 3DSMax and Blender. Standard source control GUI software like Perforce, PlasticSCM, SourceTree and GitHub | the git command line. Game, level and interaction design | playtesting (including developing data analytics tools). MYSQL (with C#, Java & PHP). | working in and on custom game engines (especially animation programming). Agile software development methods. | Optimizing algorithms and software components. Mount & Blade II: Bannerlord is the eagerly awaited sequel to the acclaimed medieval combat simulator and role-playing game Mount & Blade: Warband. Set 200 years before, it expands both the detailed fighting system and the world of Calradia. Bombard mountain fastnesses with siege engines, establish secret criminal empires in the back alleys of cities, or charge into the thick of chaotic battles in your quest for power. click here to go to the Steam page. The theme of the Global Game Jam was waves, so the idea we came up with was that the player had to lure in aliens with his frequency wave transmitter. I think it's a pretty cool game for a 48 hour game jam, the only thing I would have added, if there was more time, is a better tutorial system. The game is kind of complicating in its current state. click here to play it online. The game was made in Unity3D by me, another programmer, and a 2D artist. ODTUENGINE was my application for NHTV Breda University, where I'm doing my current study. 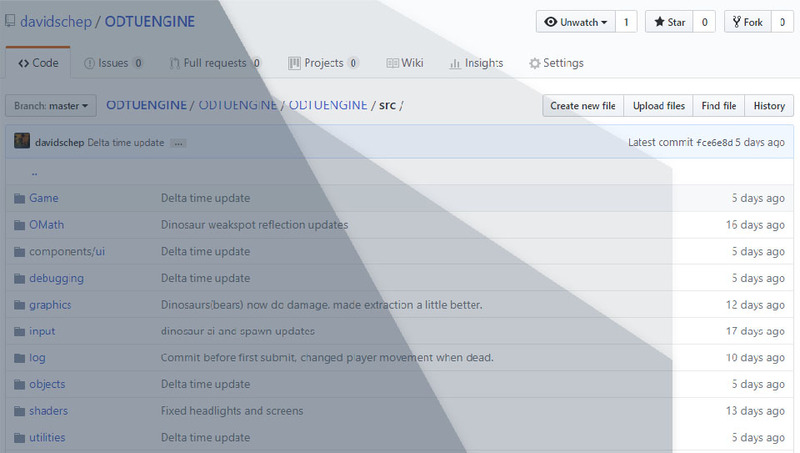 ODTUENGINE is a simple 'game engine/framework' written in C++ with the help of OpenGL. Full credits and tools used can be found in the reflection (link below). As mentioned in the reflection there are a lot of things I'd still like to change and improve, so especially the "Game" folder in the project doesn't reflect my coding standard, and was written to meet a deadline. Click here to go to the GitHub page. Click here to read the reflection (January). Digest Inn is a game that assists the dietitian and their clients to reach treatment goals, by increasing their clients’ treatment adherence, through motivating them with playful interaction. Click here to go to the DigestInn site. DigestInn is currently still in development. This is a project owned by GainPlay Studio, Netherlands. I've been working on this project as a programmer since January 2017. The text adventure we made for Lady BlaBla (an anti-bullying organization) was an awesome project to work on, it was aimed at an age group from 7 to 12 and they loved it. It’s an easy text adventure with some fun dialogues, click here to play it online. We also got to do an interview with a newspaper about it. The game was made in Unity3D by me, a 2D and a 3D artist. For some extra challenge I made it possible to add new dialogues without any programming experience so that when the dialogues got boring after a while the client could ask us to add new dialogues or even write them himself. This game was made in one of my first game jams (2 days) in a group with 2 other programmers. The idea comes from Tour de France that started in The Netherlands that year, the idea was to protect the bikers from the crowd that walks on the road and throws with cans. You also swipe bikers from the road when they fell so that no other bikers fall over them. Another developer and I presented this game to King Willem Alexander (King of The Netherlands) and the Minister for Education. This game was made in Unity3D, but it got a lot more difficult then we initially thought since we had to do a lot more work to make it perform as it should on a Android device. Eventually we got it to run a stable good frame rate within the app. You can download the Android APK here. The game was a quick Kinect 2.0 prototype. It's idea is simple, punch & kick each other until you win. The game calculates damage based on angle, speed, approach of attack and the ability of the opponent to block your attack. The goal here was to build this Kinect game, without any Kinect experience, as fast as possible. And in a few days time the result was what you see in the video on the left. Conways Game of Life is a game made to simulate life, a game is not really a good description for it though. John Conway (the inventor) calls it a cellular automaton. It’s based on a few simple rules that can create real cool effects with tiles either being on or off. This was made in Unity3D although most of the code written for it can be applied in any engine/programming language. Cattack is a fun little game me and Merel Lindenburg made in a 24 hour gamejam, she did the art and I did the programming. The goal is to kill the kittens and destroy the bad guy in the blue grey clothing. We made this in Unity3D, the lighting in the video is a bit more pretty then in the web build since UnityGL is still in development and it was important that the game would run stable, in a windows client it runs perfectly fine though. This year I attended the Unite event with Yousician, best know for their app that teaches its players to play a musical instrument. This was my first time working for a non-Dutch company, and gave me a lot of insight into how things work at some Scandinavian companies. The event game me the opportunity to meet a lot of developers from a lot of different countries, companies and fields of work. I made 2 text adventures, one in C# and one totally different one in PHP. The C# one is more of a city building text adventure and the PHP one is a Dark Souls inspired one (the PHP text adventure was a group project with another programmer). They both save their data to a MySql database and in addition to this they retrieve their game parameters, like building time for a wall, from a MySql server so in a real world scenario the game could be balanced without pushing an update to the users. The one being showed in the video is the one made in C#. Here I made a program that compresses an png to a smaller file. Instead of saving the color for each individual pixel I save a reference to a specific color in my color references tab. View the video to see the exact file structure. There are already a lot of great image compression programs out there, though I thought it was very educational to write such a tool myself. The principle i used to compress the image can be used in a lot of different situations too. This was programmed in C#. This is a replay system written for any game made in Unity3D, with a little modification it can be used for anything else too, since I used almost no Unity functions. I also wrote my own XML reader & writer for this program. The game in the video is just something to preview the replay system, and not an actual game. This was made in Unity3D, programmed with C# and the use of XML to save te file. What I'm doing here is I take a shape (in this case an octahedron, which is a double pyramid), and I make it in to a rounder object. Every iteration I add 3 vertices (corners) and create a triangle from these (that results in 3 more triangles). I make sure these triangles get the position they need to have so the model becomes more round. In the video I do this for 6 iterations total (the model most left is the basic shape). A real world scenario for this could be models that get more detailed as soon as the player comes close, so that it wouldn't take as much rendering power to render objects far away. This all was done in Unity3D with C#, though not much Unity libraries were used.